We’re very selective about accepting new snow removal accounts. We provide an excellent service for new and existing landscape maintenance and property management clients. If you’re not concerned about getting a premium service, there are plenty of other contractors you can choose that aren’t concerned either. But that’s not us… we care too much. We keep our plow route very tight and we limit snow removal services to Chappaqua NY, Armonk and Bedford. It’s the only way for us to maintain the kind of service our customers have come to love. If you’ve ever dealt with snow removal contractors before, you know how difficult it is to find one that shows up and returns calls. We do both and we don’t ever want that to change. 5 sand and salt spreaders. We largely do residential snow plowing for our maintenance clients. Although we might be in Scarsdale cutting grass, we don’t plow snow down there. Keeping our snow plow service focused on Chappaqua NY, Armonk and Bedford is the reason we can give a higher level of service. We don’t spread ourselves too thin. We do some commercial snow removal for a few apartment complexes that we’ve serviced for many years but our focus is largely residential. We have more than enough sand/ salt spreaders to keep your driveway, walkway, or parking lot ice-free. We can put you on a full snow and ice management program that takes care of everything. You do nothing… but relax when it snows. 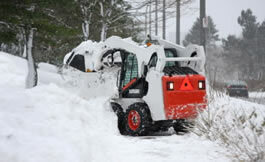 We have the commercial snow removal insurance to keep you protected. Please contact us for a certificate of insurance. Need Snow Removal Services in Chappaqua, Armonk or Bedford? Arborscape: Landscaping Tree Service Westchester NY, Chappaqua NY, Bedford NY, Armonk NY & more.